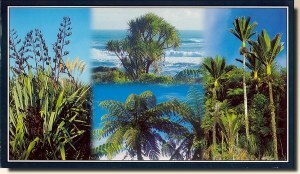 New Zealand was originally linked to the African continent and so has some distinctive, and very old, plant forms. Left: Flax, with Toi Toi (native rushes) behind. Top: Punga - native tree fern. Bottom: A Cabbage Tree, with its spiky leaves. Right: Nikau Palms - the only palm tree native to New Zealand.